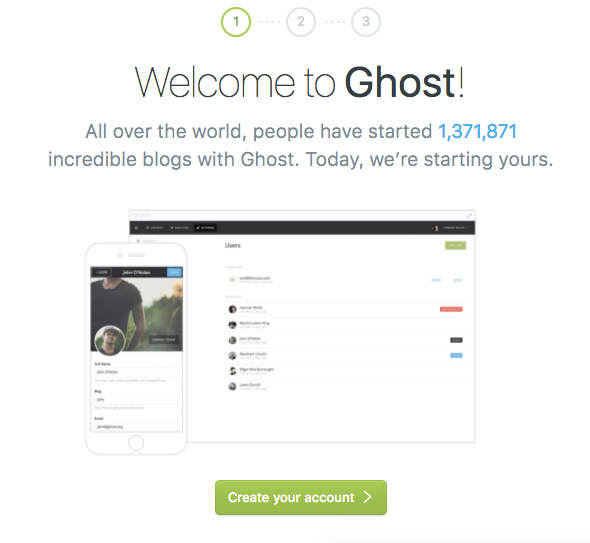 Ghost is a light-weight open-source blogging platform. Ghost is fully customizable, with many themes available. In this tutorial, you'll set up a production-ready Ghost instance on Ubuntu 16.04 using the official ghost-cli installation wizard. This will install Ghost, configure Nginx to proxy requests to Ghost, secure it with a Let's Encrypt certificate, and configure Ghost to run in the background as a system service. One 1GB Ubuntu 16.04 server set up by following the Ubuntu 16.04 initial server setup guide, including a sudo non-root user and a firewall. Node.js installed using the official PPA, as explained in How To Install Node.js on Ubuntu 16.04. Nginx installed on your server, as shown in How To Install Nginx on Ubuntu 16.04. MySQL installed by following How to Install MySQL on Ubuntu 16.04. Optionally, a domain name configured to point to your server. You can learn how to point domains to DigitalOcean Droplets by following the How To Set Up a Host Name with DigitalOcean tutorial. You'll need this to enable SSL support with Let's Encrypt through Ghost's installation wizard. We'll install Ghost using the official ghost-cli program. This program will install Ghost, create the MySQL user and database, configure Nginx as a reverse proxy, and secure the site using SSL/TLS encryption. Then ensure that your user owns this directory. With the CLI installed and the directory in place, we can set up our blog. The Ghost CLI app has an installation wizard that will walk you through all of the steps to configure a working Ghost blog. Switch to the /var/www/ghost/ directory. Then use the ghost command to install Ghost. It will configure Ghost to use MySQL as the default database. While you can use other databases, MySQL is the recommended choice for production setups. Once the install process completes, you'll be prompted for your blog URL, along with your MySQL database information. Provide the root username and password in this step. For the database name, you can use the default of ghost_prod. Next, you'll be prompted to set up SSL support. If you are using a registered fully-qualified domain name and have configured your DNS settings to point to your server's IP address, then press Y to continue. You'll be prompted for your email address, and then the certificate will be installed. Your Ghost blog is now installed and ready for use. You can access your blog at http://example.com. Now let's create an account so you can create your first post. Press the Create your account button to get started. Fill in the details and press the Last step: Invite your team button. The wizard will ask you to enter email addresses of other collaborators, but you can select the link I'll do this later at the bottom of the screen. The menu on the left lets you create a new story or manage your blog's other settings. Consult the official documentation to learn more. How To Configure and Maintain Ghost from the Command Line. How To Change Themes and Adjust Settings in Ghost.